Chicken Kiev used to the bane of my existence. Now, you might wonder what this humble family favourite has ever done to have such an emotive and overwrought statement heaped upon it. Listen though when I tell you that once upon a time, the merest mention of Chicken Kiev meant nothing but the prospect of heartbreak and loneliness; of long walks home and of tears in the rain with the words of Morrissey echoing through my head. For a short period, I had nothing but hatred for Chicken Kiev; such was the impact it used to have on my life. It was that bad. 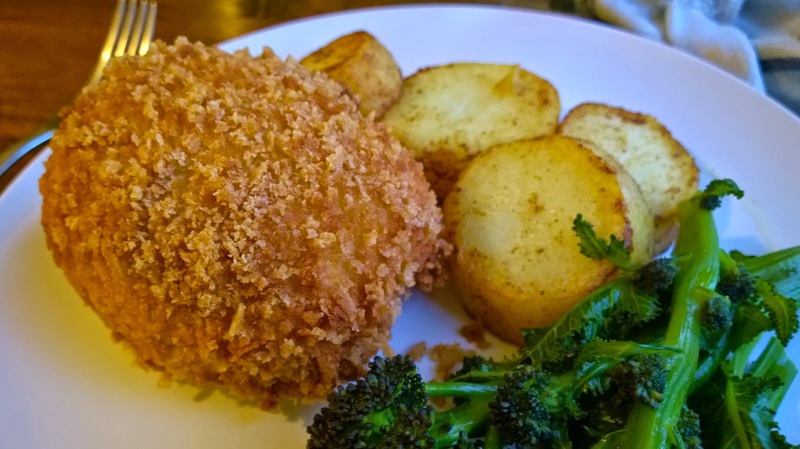 The problem with Chicken Kiev began when I was in my late teens, still living at home and still in the cosy cusp of my Mother’s bosom. Brit-pop was at its heady height and thanks to the whispy hair that was growing on my top lip; I started to venture into local indie pubs and clubs with my friends. I was lucky because my parents pretty much gave me free rein in those days and knowing I suppose that part of that youthful journey consisted of sinking pints and pints of industrial strength cider, my Mum always made sure that I went out on a full stomach. And she would then grimace and off she would trot, out of my life forever. As time went on, this began to happen more and more. The dancing became more desperate. The preening and strutting like Mick Jagger and the flailing of arms and thrashing of hair always looked like it was going to work. But then from the depths, a resounding gust of wind would always, always ruin my chances. After a while and after bemoaning to a mate that no matter how hard I tried, I just couldn’t get a girlfriend, he took me to one side and said that I had to give up eating “all that frigging garlic.” Then the penny dropped. My Mum would always, nearly always serve up Chicken Kiev before I went out. Whether this was some sort of maternal instinct, a vaunted attempt to prevent her eldest bird from fleeing the nest, I do not know. But from there on, the battle became fierce and the arguments grew. And so on it went. A terrible roundabout of capitulating at the dinner table and then heading to Romford to burp in the faces of prospective girlfriends. It really was a depressing time. I was so overjoyed I ended up using a whole bottle of Lynx shower gel. When I got back downstairs and sat at the table, all deodorised and resplendent in army surplus, I began to wonder if that night, down the sweaty pit once known at The Cellar Bar, was to be my night. My Mum then plonked a plate down in front of me and true to her word; she had left the Chicken Kiev well alone. However, in her infinite wisdom, she had decided to serve up chilli con carne instead. It took me ages to find a girlfriend. OK, so I don’t really hate chicken Kiev with that much of a passion. The aforementioned story was born out of a time when I was sure that my Mum was trying to spur my chances for romance but the damage didn’t last long. And to be fair, to fall out of love with a breaded chicken cutlet that bursts with molten, pungent butter would be a very hard thing to do. 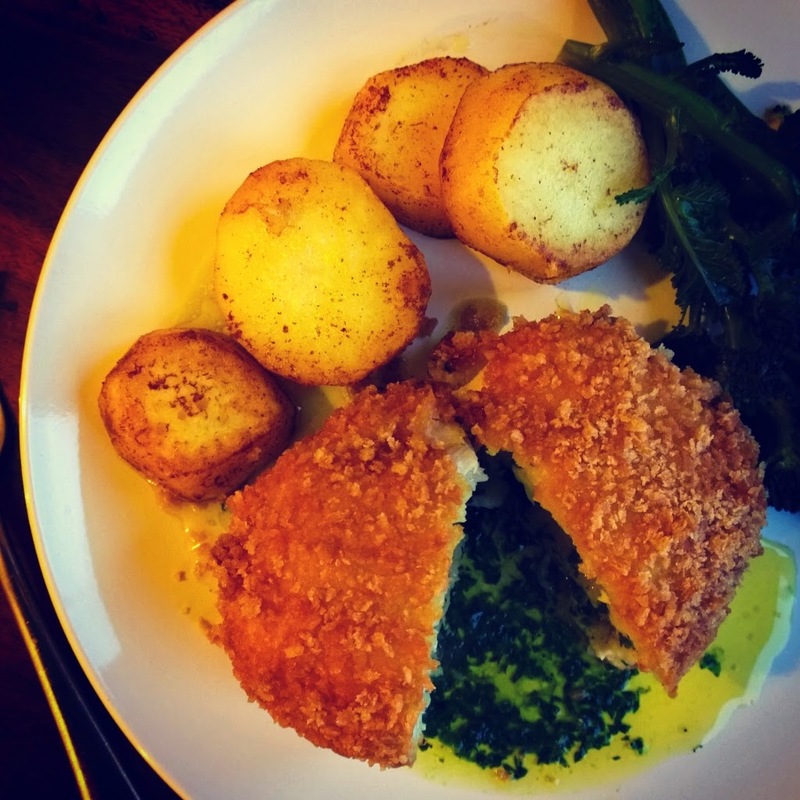 I have never actually made Chicken Kiev by hand before so I had a crack at the weekend using everyone’s favourite foraged ingredient of the moment, wild garlic. 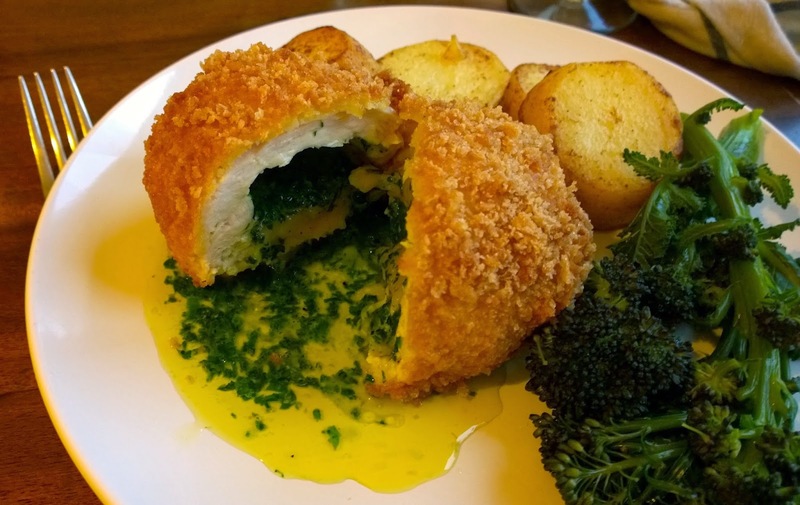 Using some tips from this recipe on Great British Chefs and this video from Chicken Kiev supremo Jesse Dunford Wood, the whole process was surprisingly easy. 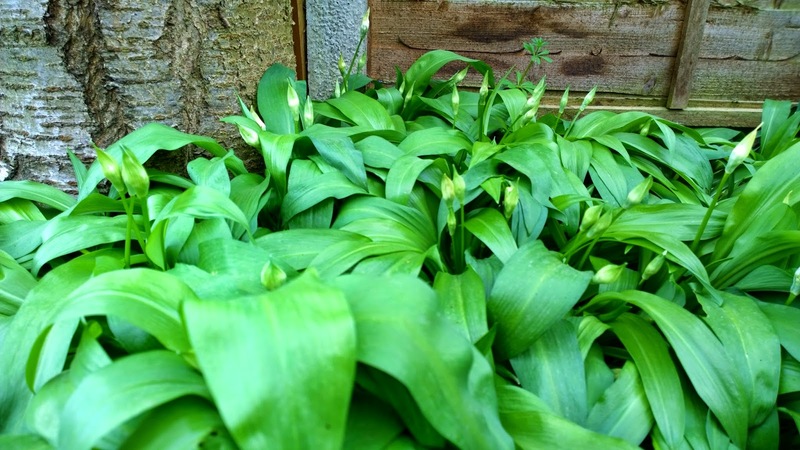 So if you can get your hands on some wild garlic (you have about 2 weeks left) do try and give this recipe a go. A word of warning though, wild garlic is no less strong than ordinary garlic so share this dish with well-established loved ones and not possible partners. First of all, leave the butter out so it comes up to room temperature and a place into a bowl. Finely chop the wild garlic and add to the butter and mash together well with a fork and season with salt and pepper. Lay a sheet of cling film on the counter and spoon the butter at one end of the sheet. 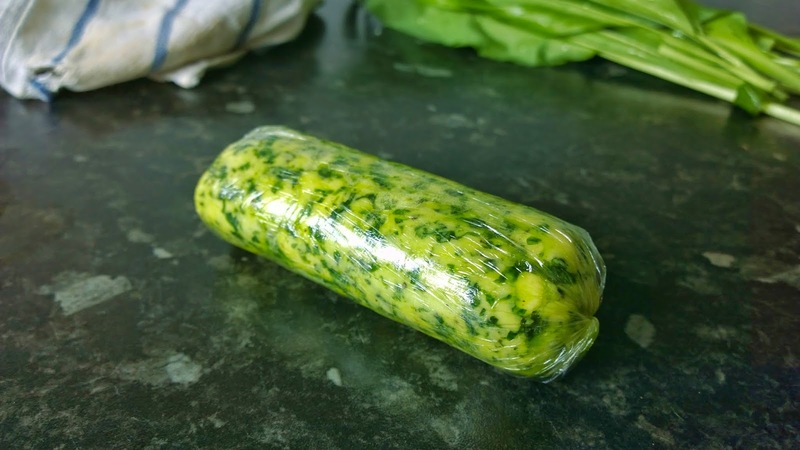 Roll and wrap the butter, forming into a sausage shape as you go and twist the excess cling film at both ends. Chill the garlic butter in the freezer for an hour. 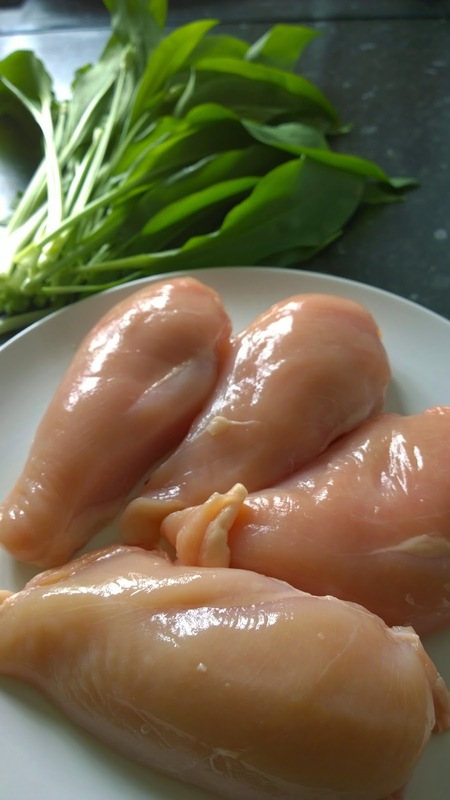 Next you need to flatten your chicken breasts so take two sheets of cling film and lay the breast meat in between. Bash out into a thin and even escalope with a meat hammer or rolling pin into as much of a circular shape as possible. If you have any odd bits sticking out, cut them off with a knife. Repeat with each chicken breast. Then take your butter and cut it into four rounds (25gms). 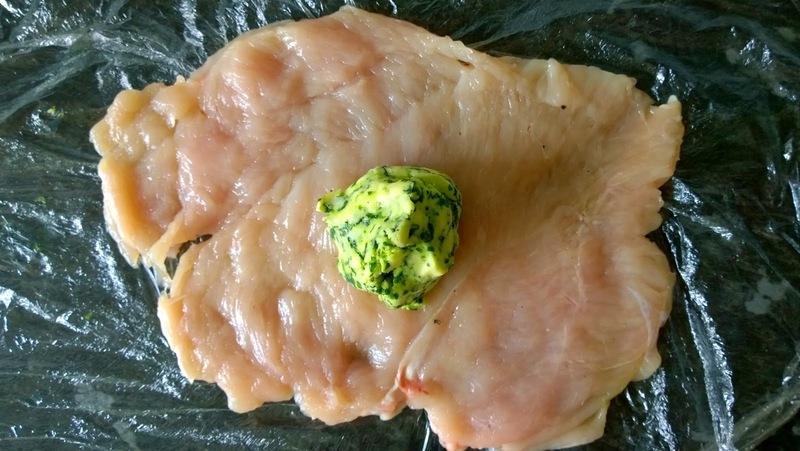 Place the chicken escalope onto a fresh piece of cling film and then put the garlic butter in the centre. Gather up the corners of the cling film and shape the chicken around the butter so that it forms and shapes into a ball, then twist and seal the excess cling film. Place into a freezer for about an hour as this will help firm them up for the breading stage. 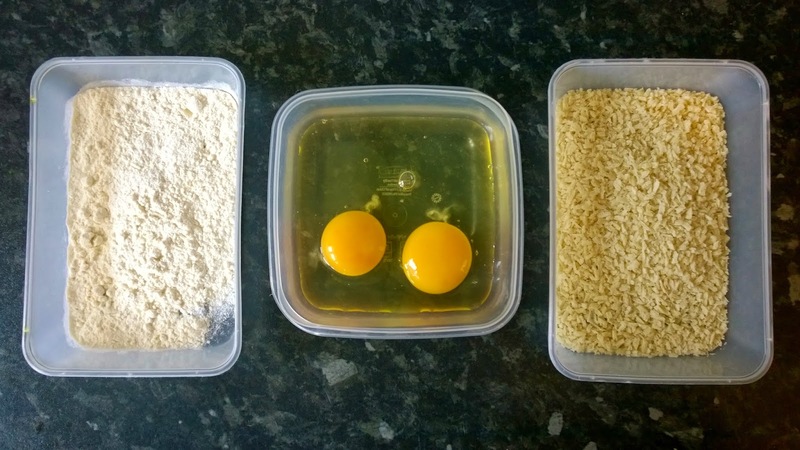 When ready, take your pane ingredients and place into separate bowls, whisking the eggs together. 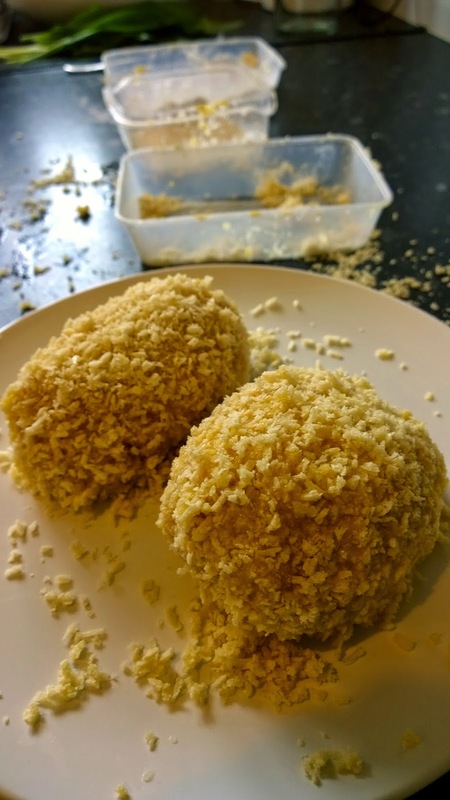 Unwrap each chicken ball and first coat evenly in flour, then in egg and then in the breadcrumbs. Repeating again with the egg wash and then breadcrumbs to ensure the chicken is sealed. A top tip when doing this is to use your left hand to coat in flour and egg and your right hand to breadcrumb (I still get messy doing this though). Leave to rest in the fridge for 1 hour. Using a deep fryer or stockpot, heat the oil to 180C and also switch your oven on, heating to 180C. Carefully lower the chicken kievs into the hot oil and fry for about 4-5 minutes, until golden brown all over, then place on a baking tray lined with greaseproof paper and cook for a further 15 minutes. It would be safe at this point to use a temperature probe to check that the internal temperature is at least 63C. If you don’t have one, resort to the skewer trick but sticking it in for a minute and then place on your lips. If it burns, it’s cooked! Serve with accompaniments of your choice (I went with fondant potatoes and purple sprouting broccoli) and marvel when you cut into your Kiev and watch all that gooey, garlicky butter spill out. I'm basically cooking everything you do, until the wild garlic runs out!